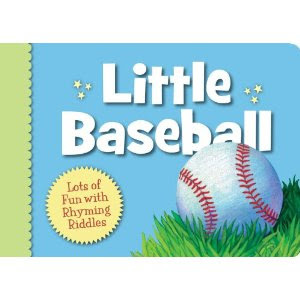 Little Baseball (Little Sports) is a handy little board book fit for the youngest baseball fanatics in our midst. "Throw and catch! Hit and run! Baseball games are so much fun!" of this piece of wood." 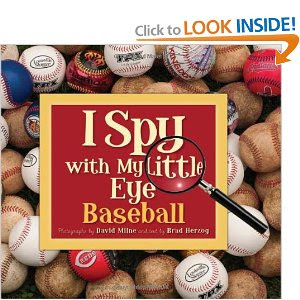 I Spy With My Little Eye: Baseball is a very clever book. You're no doubt familiar with the concept - rhyming clues are given for you to find "hidden" objects within the pages. The photographs in this book are taken by David Milne and the text is written by Brad Herzog. We are able to spy things such as coaches giving signals, upside bats, scoreboards and pitchers preparing to make a throw. (Why ARE they holding the ball in different ways as they prepare to pitch?) There are photo facts on each page too explaining facts about the game - such as why and how a pitcher can throw a baseball in various ways in an attempt to confuse the batter. 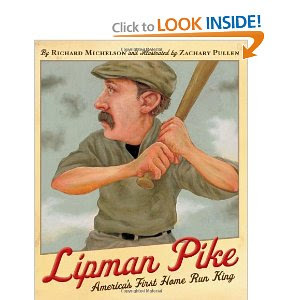 For something educational and informative, you might consider Lipman Pike: America's First Home Run King . This is the true story of Lipman Pike and it takes place in the 1800's when the sport of baseball was just captivating the attentions of Americans. Pike is the son of a Dutch immigrant and loved playing the game. However, he also had responsibilities to help with his family's haberdashery business. His mother was concerned that baseball would distract Pike from receiving a good education but his father wanted to have his boys fit in with the neighbors and so he indulged the boys in allowing them to play baseball with the neighborhood kids. As it turns out, Lipman was a good ball player. He was a good batter and a fast runner which caught the attention of professional ball players. The rest, as they say, is history. Lipman Pike: America's First Home Run King is definitely an interesting read and a fun one to add to any baseball lover's book collection. 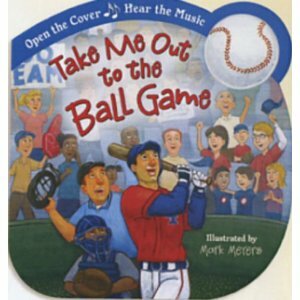 Lastly, if you had toddlers, they are almost sure to love Take Me Out to the Ball Game , illustrated by Mark Meyers and published by Ideals Publications. The text in this book is the traditional song. The fun part (especially if you are very young!) is that the moment you crack open the book, the song starts up! It's impossible not to sing along with this book (because that is, in fact, what it is designed for) and has been played over and over again (a time or two or three) in this house. Definite kid appeal. Thank you, Sleeping Bear Press and Ideals Publications for sending these titles for my perusal. We genuinely enjoyed them. Even if they are about sports. I won the first three titles about a month ago...it may be the first time my husband was truly excited for a package of books in the mail! We really do like them! Well, around here we're Red Sox fans but Texas Rangers are our #2 team. ;) Baseball is in high gear around here! I know some little readers who would LOVE these books! !